Sketch Fighter! Drawing Battle Tournament! COMICS AND COMICS PRESENTS: SKETCH FIGHTER PART 2! 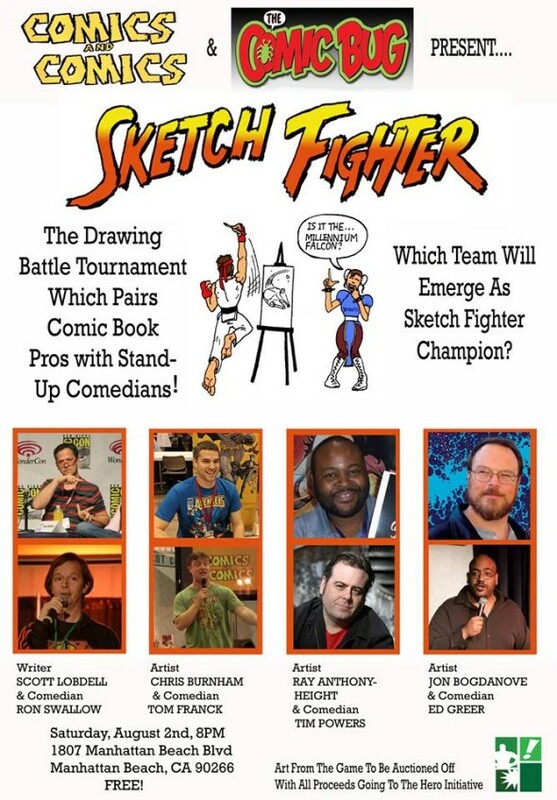 Tentative date of October 25th at THE COMIC BUG, comic book pros, TBD will be paired up with stand-up comedians from COMICS AND COMICS for the second installment of the drawing battle game, SKETCH FIGHTER. These artists may be the best in their field when it comes to 30-day deadlines, but how will they do at sketching in 60 seconds or less? Likewise, their comedian tag-team partners may be quick on their feet on stage, but when their mic is traded for a marker, will they bomb? 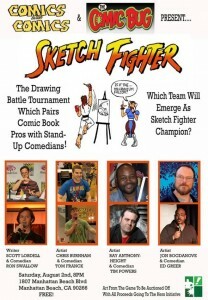 Only one team will emerge victorious and crowned Sketch Fighter Champions. Upon the conclusion of the game finals, the two pads of paper used in competition will be auctioned off, with the proceeds going to the Hero Initiative. The pads will also include a finished, not-rushed drawing by each of the artists participating, completed prior to the start of the game.